Several significant splice variants of the protein have been reported, but currently, we do not know, which variants are detected by this antibody. 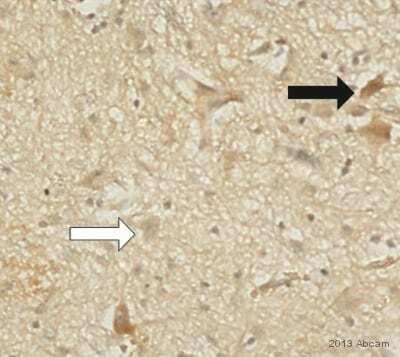 Skeletal Muscle (Mouse) Whole Cell Lysate (ab3869) can be used as a positive control in WB. HepG2 lysate and Mouse muscle lysate. Our Abpromise guarantee covers the use of ab10096 in the following tested applications. WB Use a concentration of 2.5 - 5 µg/ml. 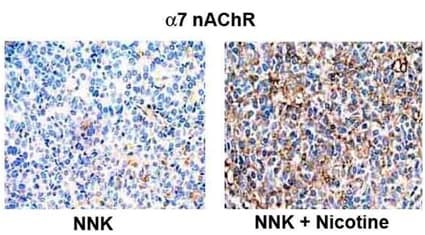 Detects a band of approximately 56 kDa (predicted molecular weight: 56 kDa).Can be blocked with Human Nicotinic Acetylcholine Receptor alpha 7 peptide (ab101467). Good results were obtained when blocked with 5% non-fat dry milk in 0.05% PBS-T. Belongs to the ligand-gated ion channel (TC 1.A.9) family. Acetylcholine receptor (TC 1.A.9.1) subfamily. Alpha-7/CHRNA7 sub-subfamily. NNK (NCI) (100 mg/kg) was administered to BALB/c mice. The mice were randomized into two groups; group one received the vehicle (PBS) (n = 8) and group two received nicotine (n = 8) by i.p. injection at a dose of 1 mg/kg three times a week for 28 weeks. Lungs from the mice were fixed in 10% neutral-buffered formalin before processing into paraffin blocks. Sections were subjected to microwave ‘antigen retrieval’ for 20 minutes on 70% power, with a 1 minute cooling period after every 5 minutes, in 0.01 M sodium citrate, pH 6.0. Slides were stained either with H&E alone or with ab10096 against α7 nAChR (1∶50 dilution). For color development the slides were treated with peroxidase substrate kit from Vector labs and developed using DAB as chromogen. After a final rinse in dH2O, sections were lightly counterstained in hematoxylin, dehydrated and mounted. WB using ab10096. Blots were incubated with ab10096 for at least 1 hour and for 30-90 minutes for the secondary antibody. 3% BSA and 10% FBS was used as blocking solution. anti- bungarotoxin was added in excess before precipitation in lanes 2 and 4. Nicotinic acetylcholine receptor alpha 7 precipitates as a double band (as shown by Drisdel and Green, 2000). The higher bands (79-122 kD) are probably dimeric and trimeric forms of the protein. Review by Andreas Wiesner submitted 7 May 2004. Publishing research using ab10096? Please let us know so that we can cite the reference in this datasheet. Thank you for the opportunity to test the antibodies. That is no problem. I hope they work well for you. If I can be of any further assistance, please do not hesitate to let me know. As far as I know, unfortunately there is no data about the protein sequences of the Helix pomatia acetylcholine receptor alpha 4 and 7. Even so I hope I can test one of the antibodies. The codes above will give you €380.00 and €370.00 respectively off your next order before the expiration date. To redeem this offer, please submit an Abreview for Helix pomatia in Western blotting and include this code in the “Additional Comments” section so we know the Abreview is for this promotion. Please remember that submission of the Abreview is sufficient for the discount code to become active. wie telefonisch besprochen sende ich Ihnen die Bestellung zu. Vielen Dank für ihren Anruf. Bitte entschuldigen Sie die Verzögerung. ich habe noch auf Immunogen Informationen aus dem herstellenden Labor gewartet. Ich freue mich Ihnen bestätigen zu können, dass vier der fünf Abcam Antikörper sehr wahrscheinlich mit den angegeben Spezies und in nativem WB funktionieren. Bitte beachten Sie, dass die anderen Antikörper von einem anderen Unternehmen stammen. Bitte lassen Sie mich wissen, ob Sie an alternativen Antikörpern von Abcam interessiert sind und ich werde Ihnen gerne helfen, die passenden Antikörper herauszusuchen. ab10096 : Homologie des Immunogens mit Kaninchen nur 46%. Ich kann deshalb diesen Antikörper nicht empfehlen für Ihre Versuche! Keiner dieser Antikörper hat einen Abbildung von nativen WB. Falls Sie dies selbst testen möchten, kann ich Ihnen zurzeit ein spezielles Angebot über einen 100%igen Abreview-Rabatt anbieten. Bei diesem Angebot bekommen Sie einen Rabatt für eine zukünftige Bestellung, wenn Sie uns ein Abreview mit dem Testresultat und Abbildung zusenden. Der Rabatt würde den ganzen Wert vom getesteten Antikörper abdecken, und gegen eine erneute Bestellung weiterer Produkte von uns verrechnet werden. 1.) Bestätigen Sie mir bitte, dass Sie welche/n Antikörper Sie testen möchten. 4.) Testen Sie den Antikörper in der entsprechenden Spezies und in nativem WB. 6.) Der Rabattcode ist nach dem Abschicken des Abreviews aktiv, und Sie können weitere Produkte bei uns bestellen (halten Sie bei der Bestellung bitte den Rabattcode). Bitte beachten Sie, dass der Rabattcode innerhalb von 4 Monaten nach Ausstellung eingelöst werden muss. 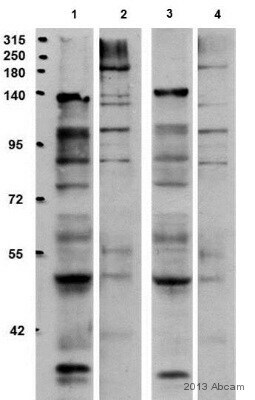 BATCH NUMBER 51969 DESCRIPTION OF THE PROBLEM no staining SAMPLE mouse muscle, human brain PRIMARY ANTIBODY AB10096, 1/100, 1/500, 1/1,000 in TBS/BSA, 30min at RT or over night at 4?C SECONDARY ANTIBODY mouse anti rabbit (DAKO #0353) DETECTION METHOD ABC POSITIVE AND NEGATIVE CONTROLS USED positive and negative controls worked well SAMPLE PREPARATION aceton fixed (10min) frozen sections, or (for human brain only) formalin fixed paraffin-embedded sections (microwave pretreatment 2x 7min) ADDITIONAL NOTES This is a complaint of one of our customers, I had already sent on October, 21st. Thank you for forwarding the complaint and for providing more information about your customer's protocol. Is this the same customer who is having problem with three of our antibodies at the same time? 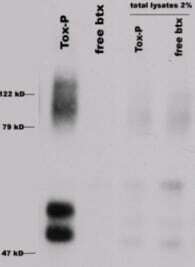 One of our collaborators has tested this antibody for us and he has also submitted a positive review. He has used this antibody on formalin-fixed samples but not on acetone-fixed cells so we do not know if it works on frozen sections at all. Please refer your customer to this scientist’s review which can be found on-line, his name is Andreas Wiesner. He obtained comparable staining using primary neuronal hippocampus cell cultures and with transfixed and permeabilised COS-cells. For staining experiments SHSY5Y-cells were costained with rhodamine coupled á-btx and ab10096 for 60 minutes. Fixation was done in 4% PFA for 15 minutes. Permeabilisation if necessary was performed with 0.002% Triton-X for 4 minutes. Ab 10096 was used at a dilution of 1:1000 and secondary antibodies at 1:200. 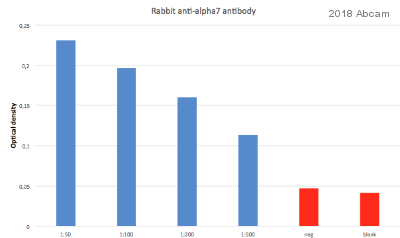 A FITC coupled secondary antibody against rabbit was used. We would like to emphasize the fact that the target is an integral membrane protein, therefore we would suggest solubilizing the membrane with Triton before the staining procedure. We hope this will be of some help.